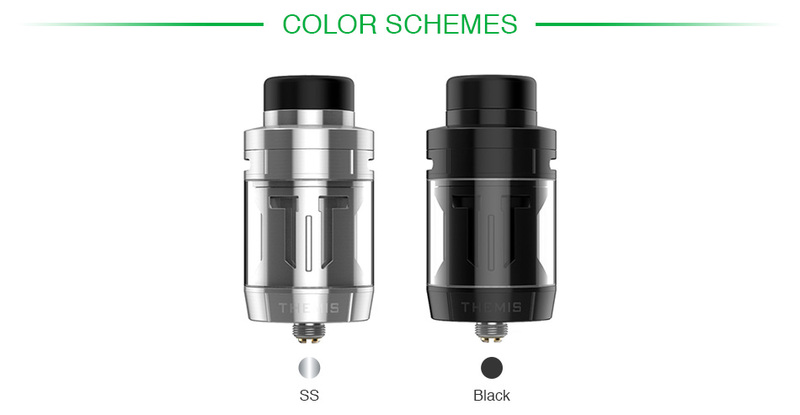 Digiflavor Themis is a unique leak-proof RTA with 5ml e-juice capacity and 25mm diameter. It adopts the innovative airflow transferring from top to bottom and providing outstanding flavor. Moreover, there are two kinds of interchangeable postless build decks available to meet your different vaping needs: the Dual Coil Version compatible with both single & dual coils builds and the Mesh Version compatible with various mesh wires. Together with quick access top cap for convenient filling, Themis RTA will bring an extremely easy and amusing vaping experience for vapers.